15' x 15' "Fun House"
13' x 13' "Palm Tree"
15' x 15' "Boxing Ring"
miles from our office area are subject to an additional $25.00* delivery fee. generator is needed. 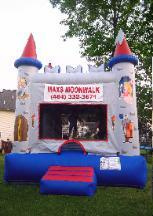 Max's Moonwalk has a generator available to rent for a $50.00 fee. your event date, and the deposit is applied to your total rental fee. your event is cancelled due to bad weather. make any occasion a memorable one for the children. Book early! available for a fee. Ice for sno cones and hot dogs are not included. Rates subject to change without notice and do not include 6% tax. $50.00 charge for returned checks.